MetroMax Lab Cart line includes a General Lab Cart, Chemical Cart, and Mobile Desk. All carts are designed to offer superior corrosion resistance. Smooth rolling, 5″ polyurethane casters come standard with each cart. All shelves adjust at 1/2″ increments, offering precise shelf adjustment and maximum storage utilization. 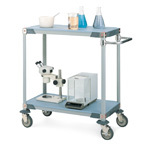 MetroMax Lab Cart line includes a General Lab Cart, Chemical Cart, and Mobile Desk. All carts are designed to offer superior corrosion resistance. Smooth rolling, 5" polyurethane casters come standard with each cart. All shelves adjust at 1/2" increments, offering precise shelf adjustment and maximum storage utilization.